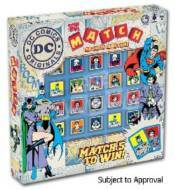 This new game sees your favourite DC Comic characters on the 6 sides of the Match cubes! Be the first to Match 5 of the same character cubes in a row (horizontally, vertically or diagonally), but watch out for the twist! The game�s not over yet, your opponent may steal the game. If they match their Top Trumps card with the winning character, they win the game!